My sister Rachel and I were trying to find out some information about our great-great-grandfather, Samuel Montagu (more about the specific issue in a later post), and I was doing various searches online. One of the places I searched was the archive of Hebrew newspapers at the National Library and Tel Aviv University, and I really struck gold! It turns out that HaMaggid and other Hebrew newspapers around the end of the 19th and beginning of the 20th centuries had regular articles about the Jewish community in England, and Samuel Montagu seems to be mentioned in almost every issue. ביום א׳,ְ 19 דיצ., חנג אחינו זה את שנת הלדתו השבעים. חתן־יובל זה הוא אהד היהודים האדוקים באמונתם, המעטים בקהלת ישראל באנגליה. עד היותו לחבר בית הנאמנים היה הוגה ימים רבים בלמוד התלמוד; מוריו היו מר היימאן והמנוח הדין ספייערם. הוא היה נזהר תמיד להתנהג ע״פ ה”שלחן ערוך”‬ בנוגע להלכות אכילה, וזהו, לפי דבריו, סוד בריאותו. פעם אחת בבקרו את ראש מפלגתו המדינית, את גלדסטון, שהיה חולה אז, הגיד לו, כי מימיו לא הלה אף יום אחר, וכאשר שאלהו גלדסטון, אם יוכל לתת טעם לזה, ענהו שזהירותו בחקי ה”שלחן ערוך” עמדה לו. אז קרא גלדםטון: “מה נפלאים המה הדוקים האלה!‬” לרגל מסעיו בארצות רחוקות לא יכול לפעמים להשיג מאכלות כשרות ויסתפק בלחם ובצל, ולא הביא אל פיו דבר, האסור ע״פ דת ישראל, מבנה גוו איתן וחסון הוא באלון, והוא נותן עוד טעם לחזק גופו, והוא—מנוחת יום השבת. בשעה, שיתר הסוחרים מעבידים את מוחותיהם גם ביום השבת, נותן הוא מנוח לנפשו ביום זה. בימות השבוע היה עובד בשקידה כל היום בבית מסחרו וגם בעניני צבור. בעסקי הקהלה הוא עסקן גדול. בימי הפרעות בשנות השמונים הלך בפקודת הועד למשען הנודרים לברורי ולבוב להושיע לבני עמו. שנים רבות היה חכר פועל לחברת הצדקה “בארד־אוו־גארדיענס” וזה שנים רבות הוא ראש וער השחיטה. כל ימי חייו הוא משתדל להרבות בתי כנסת בשכונת היהודים, ובקיץ שעבר יסד אגודה, שתפזר את אחינו, היושבים צפופים בהגיטו, למקומות יותר נוחים, לדור בהם בלונדון, ולערי השדה, כמו שכבר הודענו. בעולם המסחר הוא נודע לתהלה כאיש ישר, העושה כסף לא ע”י ספיקולציות, כי אם ע”י חריצותו, וגם כמומחה למקצעות שונים בעניני כספים. בענינים כאלה ישימו לב ביותר לדבריו נם כבית הנאמנים. הוא כתב הרבה מאמרים בירחונים בשאלות הכלכלה, ובההוצאה האחרונה של ה”אינציקלופדיה בריטאניקה” נדפס מטנו מאמיר נכבד בדבר המשקל והמדה. בשנת‭ 1885 ‬נבחר לחבר בית הנאמנים ובשנת 1888 נבחר לחבר הועד שעל יד בית הנאמנים לעיין בשאלות הנודדים ובשנת 1894 העלהו רוזבירי למעלת “בארונט”. בשנת 1900 מסר את זכותו לעמוד על הבחירה ב”ווייטשעפעל” לנכרו (נעפֿפֿע) סטיוארט םעמיול והוא בעצמו הפקד ממפלגתו לעמוד על הבחירה בלידס נגד המיניסטר לעניני אירלאנדיה גראלד בלפֿור. מראש ידע שלא יצליח במלחמתו נגד בלפור, וגם מפלגת הליברלים ידעה כזאת אבל חפצה להמעיט למצער את מספר מחזיקי בלפֿור ויבחרו במאנטאגיו לתכלית זאת, כי גדול כבודו בעיני מכיריו. בנוגע ליחוסו לציוניות, דרכו לאמר, שהוא ציוני ביבלי, כלומר הוא אינו מודה בציוניות מדינית,כי אם מאמין בציון שבכתבי הקדש, וכאשר ישובו היהודים לארצם, יעזוב גם הוא את ארמונו ועלה ירושלימה. On Sunday 19th [sic, recte 21st] December this brother of ours celebrated his 70th birthday. The celebrator of the anniversary is one of the few Jews in the English community who observe their religion faithfully. Before he was a Member of Parliament he studied Talmud for a long period. His teachers were Mr. Hyman and the late Dayan Spiers. He was always carefully to follow the Shulhan Aruch with regard to the dietary laws, which he claims is the secret of his good health. Once he visited his party leader, Gladstone, when he was ill, and told him that he had never had a day’s illness in his life. When Gladstone asked if he could give a reason for this he replied that his care in observing the laws of the Shulhan Aruch had preserved him, and Gladstone exclaimed, “What marvellous laws those are!”. On his trips abroad he was sometimes unable to obtain kosher food and would make do with bread and onion, rather than eat anything forbidden to Jews. His physique is powerful and he is as strong as an oak, and he attributes his physical strength also to Shabbat rest: while other brokers were exerting their minds seven days a week he was able to rest every Saturday. During the week he worked in his business and was also very active in communal affairs. During the pogroms in the eighties he travelled to Brody and Lvov on behalf of the [Mansion House] committee for assistance to refugees to act for his people. For many years he was a member of the charitable association “Board of Guardians” and has for some time been president of the Shechita Board. Throughout his life he has worked to increase the number of synagogues in Jewish areas and last summer he founded a committee for the dispersion of our brothers living in crowded conditions in the ghetto to pleasanter areas of London and country towns, as we reported earlier. In the commercial world he is known as an upright man who makes money not by speculation but by hard work, and also as an expert in various fields related to finance. In these matters his statements in the House of Commons are followed with attention. He has written many articles in journals on economic questions and in the latest edition of the “Encyclopædia Britannica” there was a weighty article by him on weights and measures. In 1885 he was elected to the House of Commmons and in 1888 appointed to the Select Committee of Parliament to deal with the refugee question. In 1894 he was created a baronet by Rosebery. In 1900 he transferred his candidacy in Whitechapel to his nephew Stuart Samuel and was selected by his party to stand for election in Leeds against Gerald Balfour, the Minister for Ireland. He knew in advance that he would not succeed against Balfour, and so did the party, but they wished to reduce Balfour’s majority and chose Montagu for this purpose since he was highly respected by all who knew him. As for his attitude to Zionism, he is in the habit of saying that he is a “Biblical Zionist”, in other words he does not accept political Zionism, but he believes in the Zion of the Bible, and when the Jews return to their country he will leave his mansion and go up to Jerusalem. I led a session at the Tikkun Leil Hoshaʿana Rabba at Ellul on Thursday night, which also included readings from the Writers’ Beit Midrash on Shemitta (the sabbatical year) two years ago. For my session I developed an idea that I had already presented rather briefly in the Beit Midrash. While learning the topic Shemitta, I wanted to be more aware of the cycle of sabbatical years as part of life, rather than having the sabbatical year suddenly appear and go away more or less out of the blue. (I would also like to be more conscious of the agricultural element by actually cultivating something during the six years, and not cultivating during the sabbatical year, but that’s another topic). As a way to make the concept of cycles of seven circulating within one another more vivid, I used Garage Band to make a musical composition based on cycles of seven beats, and put together various texts relating to the same theme. מעכבר העיר של השבוע: . אני סופר 4 שגיאות. ואתם? In the image above, from last week’s Achbar Ha`ir there are 11 Hebrew diacritics. I count 4 mistakes. Does anybody spot others? Via Ralph the Sacred River and Tyler Williams at Codex, I came across this article from Biblica by Professor Hugh Williamson on the Oxford Hebrew Bible Project. There seem to be problems downloading the samples from the project site, so I haven’t been able to form much of an informed opinion, but I did want to mention two things that struck me in the short sample from Deuteronomy. Like the earlier Biblia Hebraica editions which claim to conform as closely as possible to the Leningrad Codex, this edition makes no attempt to reproduce the distinctive layout of Deuteronomy 32 in Masoretic manuscripts. Professor Williamson mentions a number of anomalies created by the editorial policy of reproducing the MS text with vowels and accents, but letting emendations to the text appear unvocalized. An additional effect of this policy appears in verse 5 in the sample: . The editor has chosen to emend the text by omitting the word מוּמָם, but the other words of the verse are left with their original accents. The result is nonsense, because the accent system of the Hebrew Bible operates with longer units than single words. I’m not sure myself that the emended text improves the reading*, but that is beside the point. In terms of the accent system, omitting one word implies an emendation to the surrounding words as well. In this case “בָּנָיו” has become the last word of the clause, but the editor has left it with a conjunctive accent. This may seem like a quibble to people unaccustomed to reading the Bible with the accents, but I personally was unable even to parse the result until I had worked out what was intended by reading the critical notes. If I wasn’t an expatriate Brit readapting to life in Israel after two years in California, I would love to be Canadian. I’ve never yet been to Canada, but that’s soon going to change: at the end of this month I’ll be in Whistler, BC. This one is probably also pretty easy, but it should require a little more leg work at least. A gift Crossword subscription has been purchased for you. This clearly has some connection to the fact that next Monday is my birthday, and this is absolutely and totally the best birthday present I could have wished for (though strong self-discipline will be called for if I’m going to get any work done if I have hundreds of Guardian crosswords available every time I sit down at the computer). The frustrating part is that it doesn’t name the generous person who gave me this present!!@#$! I can narrow it down quite a lot: it has to be someone who knows that the Guardian Crossword, especially Araucaria, is one of the things I most miss about not living in the UK; it has to be someone who knows my email address; and it has to be someone who loves me enough to splash out on a birthday present for me. I know who I think it was, and that person reads my blog, so if it was you, thank you so much! Britain’s biggest journalists’ union, The National Union of Journalists, has criticized Israel’s “military adventures” and voted narrowly in favor of a boycott of Israeli goods…The timing of the ballot was particularly delicate since a BBC journalist, Alan Johnston, has been held for more than a month in Gaza, making the boycott call seem one-sided. We are often warned against over-generalization, and on mailing lists and web fora you can almost guarantee that any statement about “all” p or “the only” p, whether p is members of some ethnic group, documents in some language, or whatever, will provoke angry responses and obscure counter examples. I’ve been on both sides of this process myself, most recently here. many authors wouldn’t bother writing web pages if they weren’t finite. I’d love to meet the authors who would bother writing infinite web pages, though I suspect they might have trouble fitting me into their busy schedule. The only explanation I can think of is that the author had taken the lesson “don’t overgeneralize” a little bit too much to heart. Danya posted about baking challa. In the interests of Jewish pluralism, here’s my recipe. These quantities make 5 medium-sized or 4 largish challot. sesame seeds and/or poppy seeds. Mix the flour and salt together in a large bowl and make a well in the middle. Pour a little boiling water over the saffron, stir well and leave for a few minutes. Stir the yeast and honey together until the yeast dissolves. Add the lukewarm water, the saffron, and the eggs to the yeast (keeping back about 1/4 of an egg for glazing) and pour into the flour. (This is best done in two stages, otherwise you leave behind a residue of yeast). The total amount of liquid should be about 625 cc for 1kg of flour. Fold the flour over the liquid and leave it for about 20 minutes until it starts bubbling up. Stir the liquid into the flour and knead well for at least 5 minutes, adding more liquid or flour if necessary. The dough should be slightly sticky. Cover with a towel and leave to rise for an hour or two. Knock in the air, and knead it a bit more. Divide into 4 or 5 balls, divide each one into 3, and braid them together. Paint with the rest of the beaten egg and scatter sesame or poppy seeds over the top. Bake at 220° C for 30-35 minutes. 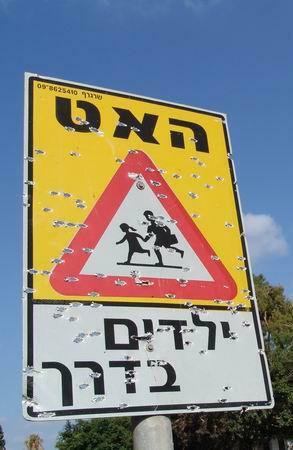 Here’s a picture of a road sign in Haifa after a Katyusha missile landed nearby. The text on the sign says “Slow — Children Crossing”. To see more pictures from Haifa by Lenny Maschkowski, go here or here, or the slideshows linked from the bottom of this page. Peter, just because some man in a red coat gives you a sword it doesn’t make you a hero! It snowed in Jerusalem today, but if you blinked you missed it. הקנגורו עונה לשם איציק וצבעו חום בהיר עם זנב כהה. Lost on Thursday 2/2/2006 while going for a walk on **** St. The kangaroo answers to the name of Itzik and is coloured brown with a dark tail. Me to Ellat (aged 7) planning to lead up to “the Beit Yosef’s Question” to see how she handles it: Tell me why there are eight days of Chanukkah. Ellat totally short-circuiting me: Because when the Jews restored the temple, it took them eight days. Me trying to get back to what I hoped was going to be the topic: But what about the miracle of the flask of oil? Ellat considers it for 1/10 of a second and delivers the coup de grace: It would appear that that’s a legend. It made me smile to read this today, because I was watching the 10th anniversary special edition DVD of The Shawshank Redemption just last weekend. I hope I can make it across the border. I hope to see my friend, and shake his hand. I hope the Pacific is as blue as it has been in my dreams. I hope. Another thing they mentioned was the problems people have remembering the title, and the writer/director said “Nobody ever came up with a better one”. In Israel it was called “חומות של תקוה”, “Walls of Hope”, which is not at all bad. I guess it comes down to a simple choice, really. Get busy living, or get busy dying. I realized much too late that the last two posts have the wrong title. It’s actually called Hebrew Book Week, (שבוע הספר העברי), not Jewish Book Week. Neither title is really totally appropriate. There are lots of Hebrew books on sale that aren’t in any way Jewish, in fact my impression is that about 75% of what’s available are cookery books and travel guides, and there are plenty of books in other languages. Just for example, the book I was raving about yesterday is mostly in Aramaic. It’s a shame that there isn’t an Aramaic Book Week. They could sell the screenplay of The Passion of the Christ . Talking of Aramaic, it’s a real כיסופא that Mozilla doesn’t recognize content marked up with lang="arc" as being in Aramaic. Klingon was more important? P.S. : I apologize if the title of this post messed up anybody’s RSS feed. I try to avoid filling up with petrol on a Friday morning. There’s a universal custom at filling stations here that anyone who buys more than a certain amount of petrol gets a free paper. Since the Friday paper is much larger than on the other days of the week, and costs more, most of the population makes a point of filling up early on a Friday, since it’s obviously worth while to save ₪9.60 (about $2.20), right? Well, only if your time has no value. Since everybody else is doing exactly the same thing, the queue at the petrol station on a Friday morning stretches right down the street, and you can wait a good 15 minutes for the privilege of your free paper. And it’s not as if Israelis don’t mind wasting time. These are the same people who will hoot at you as soon as the traffic light turns green, or even a few seconds before; the same people who will cut round you if you stop at an intersection to let a child finish crossing the street; the same people who will swerve up on to the pavement to get to a right turn instead of waiting for the car in front of them to clear the intersection. העיקר לא להיות פרייר של אף אחד. Sorry, that’s not really translatable. It means something like “don’t ever let anyone take advantage of you”, and is used to justify every possible kind of selfish and aggressive behaviour, like jumping queues, littering the streets, falsifying income tax returns, and standing stock still in narrow gangways so that other people have to push past you instead of getting out of their way.